Today, over 97,700 companies have come to rely on salesforce.com because everything they need to do their jobs is in one place. Or is it? While sales managers love the real-time visibility into their team’s activities so they can forecast sales with confidence, there is still an untapped goldmine sitting in salesforce.com databases and the sales analytics in salesforce.com aren’t able to tap into it and integrate it with other meaningful data. Birst’s Salesforce Reporting and Analytics helps sales managers analyze all of the critical salesforce.com data to uncover insightful pipeline information. Combining sales data with marketing, financial and operational data to obtain a comprehensive view of the pipeline is where Birst excels. Birst enables sales managers to address risks and issues proactively and make course corrections quickly. 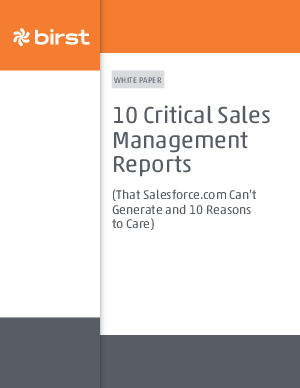 There are currently 10 sales management reports that salesforce.com is not able to produce that can dramatically impact how well sales managers understand what is happening with their pipeline and forecasts.